Welcome to our new Student Services Intern, Estelle! We Welcome our new Student Services Intern Estelle from France at our Oxford English Centre. Q: What did you do before you came to EC Oxford? Before coming to Oxford I was a 3rd year student in International Business in France. Last year, I took part of the Erasmus program and I studied at Plymouth University. Q: What is your role here in EC Oxford? I am assisting the Student Services Team. Q: What have you enjoyed about working at EC Oxford so far? I love the atmosphere here at EC! Everyone – the staff and the students – is very friendly and lovely. The job is varied and I am looking forward to work here and to meet a lot of new students from around the world! Q: What do you like about Oxford as a city? Oxford is charming and so beautiful. I love the amount of activities you can do here – theatre, museums, cinema, punting… Every week I discover another thing to do! Q: What’s your hometown? Can you describe it to us? I grew up in Lannilis, a small town of North Brittany – very near to England as crow flies. Lannilis is very close to the sea, so it is perfect when you want to go surfing or sailing! Also, when I am going back from university, I love the fresh air and the countryside. Lannilis is perfect for long horse rides! Q: Our school is all about helping people who are learning English, but have you learned any other languages? How did you learn them? I always loved to learn languages – I started to learn Spanish when I was 11 and I did a few exchanges with other schools in Spain. Since I went to study in England I lost my skills a bit but I hope that with practice I can catch my previous level. I also started to learn Italian two years ago thinking it would be easier as I know Spanish – but I found it actually very confusing. I still need to learn and improve myself! Q: What do you like doing in your free time? I love sports – especially horse-ball, but it is not very known in the UK. I also love spending time with my friends. I plan to integrate a Master degree in International Management in September and I hope I could work in England in a few years! A tip on how to be positive! 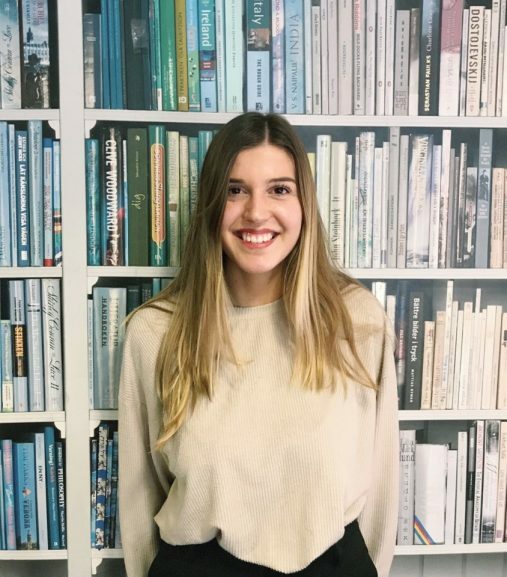 Welcome to our new intern, Alexandra!